Real hobos don't use cellular phones. Recreational hobos, however, are an increasingly wired breed. Once, Depression-era tramps scratched symbols on train trestles to pass information to others looking for an empty boxcar and a free ride. Now so-called yuppie hobos - who sneak onto freight trains for adventure rather than out of economic necessity - use scanners to monitor railroad frequencies and cellular phones to talk with other hobos. They also trade information via more than two dozen Web sites, as well as e-mail discussion lists and newsgroups. "Those of us fortunate enough to have modems use our public and secret hobo communities on the Net to keep in touch, share rail information" and complain "that the railroads are getting too tough on us innocent rail riders," Todd Waters, 50, a recreational hopper, said by e-mail. Waters, who once rode the rails full time in his youth, theorizes that the appeal of freight-hopping is due to what he calls "the drift: "For me, the drift occurs when I migrate from the linear world, neat with its processes and models, to the road, where everything happens at once. You've got a general direction, but it doesn't have much glue on it. The plan has equal weight to every new distraction that comes along." Recreational hobos train-hop in part to pay homage to an ideal of hobo freedom and self-reliance that experts say belies historical reality. Yet, their stories of hopping can have a romantic appeal and an infectious enthusiasm, as evidenced by those found on the Train Hoppers Space [see below] and other sites. Hans-Christoph Steiner of Manhattan posts photos of his hops on his personal Web site [see below] and takes part in a recreational hobo mailing list. "The idea always intrigued me," he said of train-hopping. "I liked the image of a hobo: a self-sufficient wanderer who doesn't burden others." Steiner said he was hooked after his first hop with some college friends from Portland, Ore., to Seattle: "Even though we spent 10 hours waiting for the train in two different yards, the trip was well worth it," he wrote in an e-mail. "We came upon the Puget Sound - the tracks were right on the coast - and we watched the sunset while sitting on top of a double-stacked container car traveling through the forest." 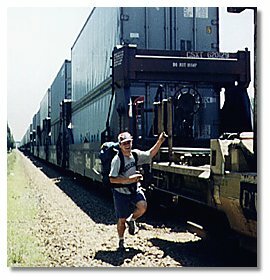 But the online activities of recreational freight-hoppers - whose hobby is illegal and dangerous, as a disclaimer on Steiner's page states - has also drawn the ire of rail-safety groups, known as "rail fans" who fear a crackdown on legal access by all train hobbyists, and the railroads themselves. Some Web sites now offer a contrary view of hopping. One such site, www.deadtrainbums.com, contains gruesome photographs of what are said to be hoppers caught beneath the rails, and links to news articles about injuries and deaths related to railroad trespassing. In 1997 deaths caused by trespassing in railyards and on railcars (not including suicides) increased 15 percent over 1996, according to the Federal Railroad Administration. While the statistics don't reveal how many of those deaths involved hobos, some believe there is a link between the availability of online information about hopping and the rise in trespassing. In testimony before the House subcommittee on railroads in April, Gerri Hall, president of Operation Lifesaver, a rail-safety group, said: "Effective action needs to be taken to discourage the promotion of romanticized images of dangerous railroad trespassing activities. We need to find a way to put a damper on Web sites that encourage unsuspecting young people to engage in illegal and dangerous activities on railroad property." Sarah George, a filmmaker completing a short documentary called "Hobo Jungles," said she had heard estimates from 10,000 to 100,000 regular freight-hoppers. "But my guess is there are probably a couple thousand really hard-core riders and maybe as many as 20,000 who ride the rails occasionally," she said. Of those, she said, the largest general groups are true tramps (mostly men from 30 to 50 years old who are indigent) followed by "punks" (youths rebelling against society). She takes a dim view of purely recreational hobos. Ms. George's own Web site [see below] drew an angry response from the freight railroads, she said, because they feared the film would glamorize hopping. Railyard personnel were told to be on the lookout for her cameras, she said, and she took down all but a brief description of the film from the site. Mike Furtney, Union Pacific Railroad's director of public relations for the Western region, says that with just 250 special agents to police 35,000 miles of track, Union Pacific has started keeping at least a casual eye on hobo sites. This monitoring results in "a small, incremental amount of intelligence for our agents," he says. And railroad employees have been known to post personal messages on newsgroups to counter the hobos' information. Perhaps the most well-known recreational hobo is a man known only as North Bank Fred , a middle-aged construction worker who is determined to preserve his anonymity and who collects photos of modern-day "monikers," hoppers' painted or scrawled symbols. He recently removed an extensive collection of hopper anecdotes from his page [see below], citing "the prying eyes of the railroads." Via e-mail, North Bank Fred said "the Internet is the perfect way for me to get my "information" out to people who can benefit from it," who he said were "Net-savvy would-be (or current) train riders or established riders." "Attention from such a broad-based audience as newspaper readers can only do harm to freight-hopping - it has in the past and I'm sure it will happen again." Bill Mellman, another recreational hopper, has become even more ambivalent about his Net presence. Although a frequently-asked-questions document [see below] he wrote several years ago on hopping continues to be linked to widely, he now requires a password to view his main hobo page. Mellman says he threw a roadblock in front of his site not because of surveillance but because "I just started to get worried that I could end up being responsible for some kid getting his legs cut off."